This design guide covers timber framed construction in various building classes, providing simple step-by-step guides to achieving BCA compliance. WoodSolutions Design Guides have been developed to provide an authoritative source of information for design and construction professionals, the timber industry and other interested readers. Written by specialists, each guide aims to present the most up-to-date information to facilitate compliance with regulations including the National Construction Code (NCC). Please Note: Elements of the NCC may vary between states and local jurisdictions. Check with your local authorities if you are unsure. Printed copies of most guides are available for purchase from SAI Global. The guides are available for download at the base of this page. You must be a registered user to download documents – registration is fast and free. Design Guide 3 offers designers, specifiers, builders, code officials and certifying authorities a guide for interpreting fire-resisting timber-framed construction that complies with the BCA. 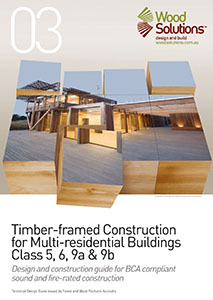 For timber-framed construction, this guide demonstrates achievement of targeted fire and sound performance requirements in the BCA for Class 5, 6, 9a and 9b buildings. In this context, the guide provides certified construction details that utilise the BCA Deemed to Satisfy Provisions. It focuses specifically on fire-resisting construction of wall, floor and ceiling elements. The guide does not deal with other aspects of BCA fire safety performance, refer to Appendix B of this document for further details.